If you ever find yourself headed to Costa Rica, then there is no better way to explore its Caribbean coastlines, rich cultures, and treelined rainforests than in a luxury villa. So, TeamCoco checked out all the absolutely stunning luxury Costa Rica Private villa on offer at Luxury Retreats, and picked out a few of our favourites — so you can travel to Central America in style. After all, who doesn’t want to relax by a gratuitous Infinity pool, (mojito in hand) after a long day of holiday-making? 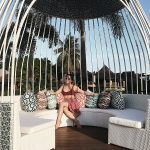 Luxury Retreats is a full service luxury villa holiday rental service, dedicated to make your vital dreams come true.With over 3,000 destinations 5000 luxury villas, matched with impeccable service – Luxury Retreats create unforgettable vacation experiences that are just a cut above the rest. Casa Ramon is a sprawling 6 bedroom and 11 bath villa which can accommodate up to 14 guests, just a stone’s throw away from the quaint town of Dominical, and just a quick walk to Playa Hermosa. A neutral colour palette of cream, tan, and earth tones make you feel like you are at one with nature, which is exactly how you should feel on a luxury holiday in Costa Rica. Casa Ramon’s main appeal has to be its generous outdoor spaces. Everywhere throughout the villa’s massive expanse, you can enjoy breathtaking panoramic views of the surrounding jungles and even look out into the calming waters of the sea. 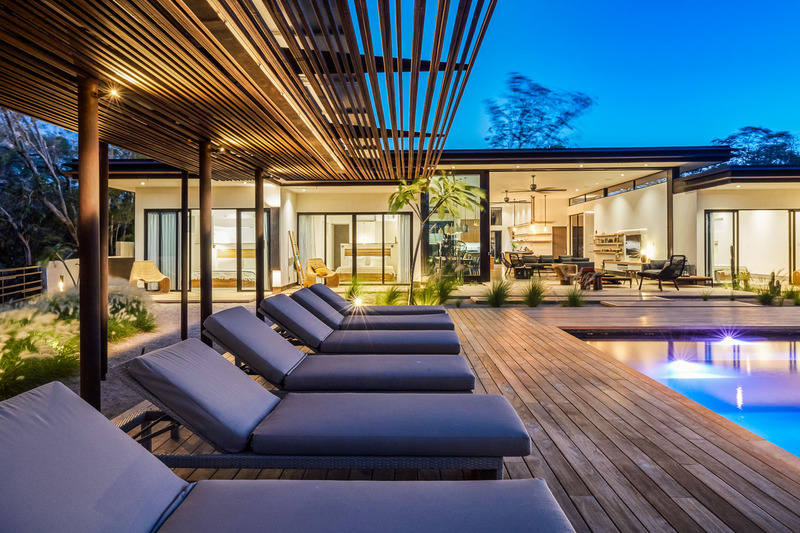 The focal point of Casa Ramon’s’ outdoor space is the pool and unheated jetted tub, dotted around are covered seating areas and some super zen yoga spaces. For barbecue enthusiasts, there is also an outdoor kitchen and grill on site, as well as bar-style seating and dining table. The perfect way to spend a summer afternoon with your family, amidst the natural sceneries of Costa Rica. Every bedroom in Casa Ramon has a king sized bed and en-suite — so if you’re travelling with your family, there is no need to call dibs on the best room. 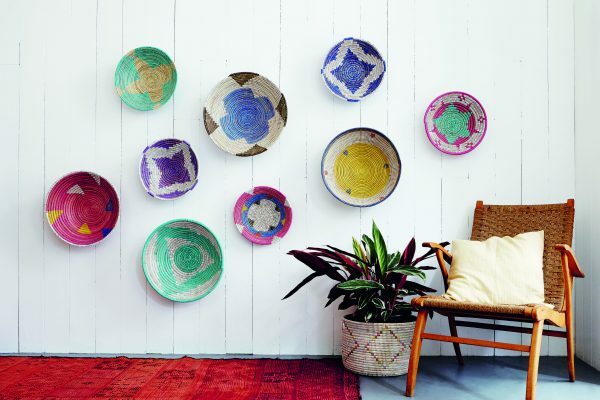 At Casa Ramon – every room is the best room. If you do venture out of Casa Ramon’s beautiful space, make your way to the beautiful sands of Playa Hermosa, or even to the Alegre One snorkelling school and explore the treasures of Costa Rica’s rich and colourful marine life. 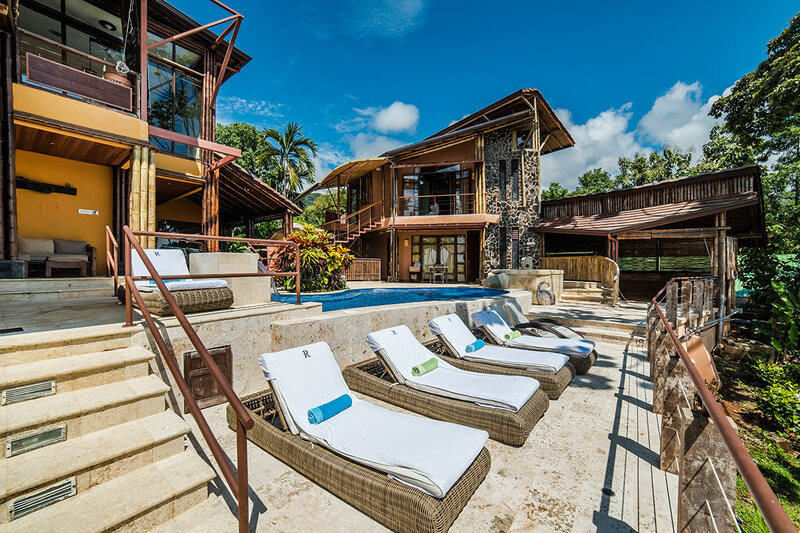 There’s never a shortage of things to discover in Costa Rica; but with a luxury home base like Casa Ramon – it would be very difficult to leave! 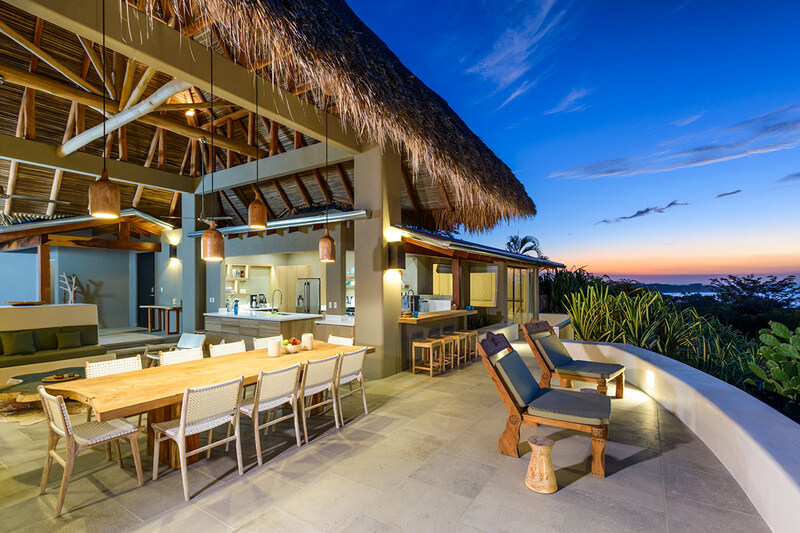 Villa Morabeza is a sleek modernist beachfront marvel set right in front of Costa Rica’s stunning coastline. With the Tamarindo Beach and Langosta Beach literally just a minute away from your doorstep, you won’t find a better luxury beach hideaway anywhere else in Central America. Villa Morabeza has sprawling open spaces which is made even more generous by the minimalist contemporary design. The villa’s colour palette is almost monochromatic; with earthy touches of natural textures and fabrics. Light touches of woven furnishings, wooden wash basins, and black mid-century modern design details all add that little extra something that make Villa Morabeza a design-lovers paradise in the sun. With eight generously sized en-suite bedrooms, Villa Morabeza can easily accommodate twenty guests. Perfect if you’re planning to take your next family holiday up a notch — or ten. The kitchen is filled with all the modern appliances a luxury kitchen needs, and also includes a handsome wood dining table for twenty. Outside, there is an alfresco dining area, pool, sandy beach pad, yoga area — and more lounge spaces than you can count. Not to mention, the villa’s all-natural MistAway pest control system allows you to enjoy the outdoors without needing to worry about pesky mosquitos. If you are in the mood for exploring, Tamarindo Beach town is just a five minute walk away from Villa Morabeza’s beautiful gated community. Aside from the charming little bars, boutiques, and restaurants lining the street of this quaint seaside town, the nightlife is also something special. Who knows what trouble you can get into, on a night out Tamarindo, but no matter how many tequilas you get down you, at least you know you’ve got stunning villa to come home to in the Villa Morabeza. Designed by world-renowned San Diego based architect, Steve Adams, The Sunset House is the perfect balance of contemporary design and tropical style. Every corner of the Sunset House features a highly curated interior design concept by Mu Design, perfectly executed by Flor de Pacifico and Jeff Hutton. The villa complements the topiary of the surrounding jungle and is built using a combination of natural materials like stone and wood. Its open layout allows maximises the jungle views and its high ceilings allow for a gentle tropical breeze to cool you down amidst Central America’s tropical weather. The Sunset House coins its name from its magnificent sunset views. 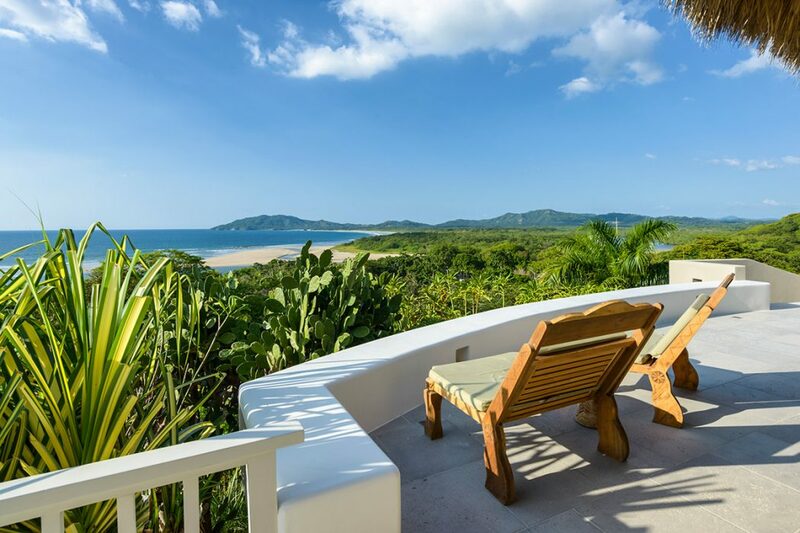 The sprawling terrace is the perfect place to enjoy unforgettable views of the Guanacaste sunset, as well as views of the pristine white sand beaches and estuaries. Here, the indoor and outdoor spaces seem to blend seamlessly together. The villa’s open plan/open air design allows for maximum ocean views — with the main focal point being the thatched roof-pavilion. Inside, you will find a ten seater dining table, a fully equipped kitchen, and mid-century modern design accents that elevate the villa’s sleek but cosy contemporary design. The light-washed open spaces also invite the fresh open breezes; making for a truly relaxing and modern seaside escape.There are five en-suite bedrooms at the Sunset House, one with a private terrace and another with an al-fresco shower. Perfect for a luxury holiday that packs the punch in terms of both design and comfort.